CII IWN had unveiled an ambitious program ‘100 Hours of Change (HOC)’ – as an attempt to create the biggest pool of women mentors who can help students and other women rise to their full potential in their careers. 100 HOC is an ambitious project where the Network linked up women who have had the access to education and financial independence with those who are just venturing out and want to contribute. The idea was to help create real role models who can bring about positive change where it is required most. The initiative was launched by Indian Women Network’s Madhya Pradesh Chapter on Friday, 28th November 2014 at Shri Cloth Market Institute of Professional Studies, Indore. 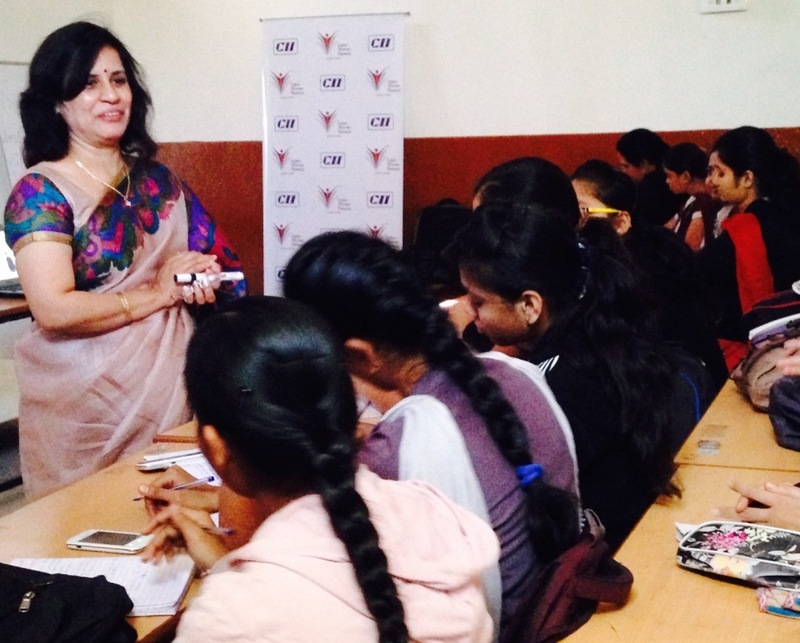 A session on “Personal Grooming: An important aspect for a Successful Career” was organized. Speaker Ms Rashmi Pastaria, Senior Trainer, Communication Skills, Acropolis Group of Institutions explained the participants that our outer persona can be upgraded through grooming only and one can add class and finesse to one’s personality through it; proper grooming does help to climb the top rungs in one’s career.